Foreign Minister Ernesto Araujo met with Maria Teresa Belandria, appointed six days ago by Juan Guaidó as Venezuelan ambassador to Brazil. RIO DE JANEIRO, BRAZIL – The Brazilian government will set up a humanitarian aid distribution center in Roraima, on the border with Venezuela, Brazilian officials said Monday. The announced was made after a meeting between Brazil’s Foreign Minister Ernesto Araújo and Venezuela’s new ambassador to the country, María Teresa Belandria. 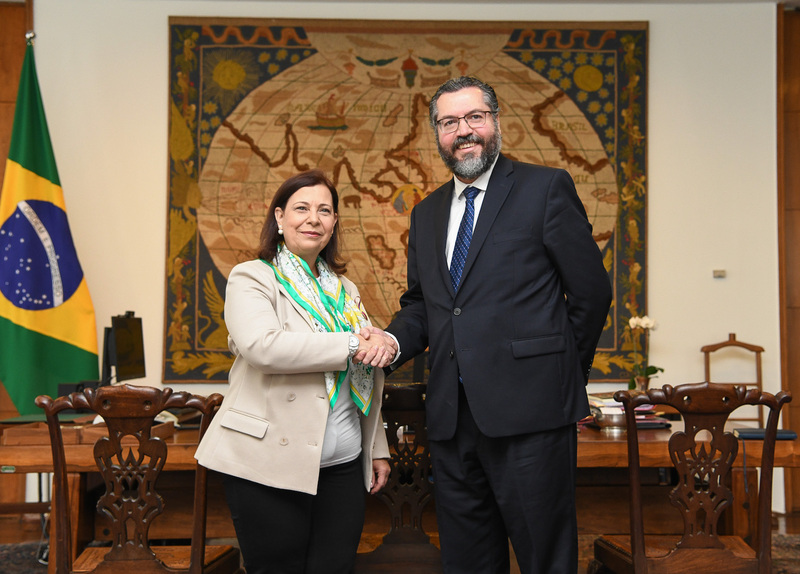 Brazil’s Foreign Minister, Ernesto Araújo, met with Venezuelan ambassador to Brazil, Maria Teresa Belandria, on Monday, photo courtesy of Brazilian Foreign Ministry. “The Brazilian government is defining, in a process of inter-ministerial coordination, forms of support that can be provided to the Venezuelan people and to the Government of President Guaidó in the process of transition towards the reestablishment of democracy in Venezuela,” read the statement issued on Monday by Brazil’s Foreign Ministry. Belandria was appointed six days ago by Juan Guaidó, who proclaimed himself acting president of Venezuela in late January and challenging the legitimacy of the presidency of Nicolas Maduro. “We thank all the people of Brazil, who understood the needs of all the Venezuelan people and did not raise any resistance whatsoever [towards the Venezuelan people],” said Maria Teresa Belandria after the meeting. According to Belandría, the Venezuelan population needs food, medicine, as well as logistical support, transportation and security. Officials disclosed that the location of the distribution center has not yet been decided but that it will probably be installed either in Pacaraima or Boa Vista, both located in Roraima state. The newly appointed ambassador said she would meet in the coming days with the group responsible for humanitarian aid coordinated by the Brazilian ministries of defense and health. In addition to Brazil, several countries, including the majority of members of the Lima Group, the United States, and several European Union members, have recognized Guaidó as Venezuela’s new president. Asked by journalists what her situation will be if Maduro remains in power, the new Venezuelan ambassador to Brazil said that such hypothesis has not been taken into account. “We do not work with that scenario,” said Maria Teresa Belandria.